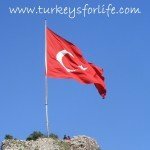 Turkey ▸ History & Culture ▸ Turkey Museums ▸ Resident In Turkey? Have You Got Your Müzekart Or Müzekart+? Resident In Turkey? Have You Got Your Müzekart Or Müzekart+? A year and a half ago, after changing visa rules, the Turkish Foreign Ministry reduced residency fees for British nationals who were either living in, or spending significant portions of time coming backwards and forwards to Turkey. We took advantage of this and applied for Turkish residency and, we’re happy to report, all is well. We own a little blue book which means we don’t need to leave Turkish borders every three months, and the money we save by not having to do that means we can travel to other places such as Italy and our upcoming trip across Turkey. Aside from that, daily life has pretty much remained the same. In fact, things are a bit more chilled because we don’t need to keep half an eye on the calendar to make sure we don’t overstay our welcome here. For us, personally, there were no more real benefits – and then the Müzekart (museum card) was made available to residents as well as citizens. Brilliant! We love to explore different archaeological sites and visit museums in Turkey but, when you’re travelling on a budget, these type of activities soon start to relieve you of a lot of your cash; entrance fees can be anything from free up to 25 TL per person. Becoming eligible for the Müzekart has solved a big travel problem for us – and so we took ourselves off to Kayaköy last week to make our purchase. The standard Müzekart (we were under the impression this was the only Müzekart) costs 30 TL and is valid for one year, from the date of purchase. Entrance to all state owned museums and archaeological sites is free and there are discounts for entrance to some privately owned museums. But entrance is limited. With a standard Müzekart, you can only visit the same place twice in your 12 month period. After that, you need to pay the full entrance fee. 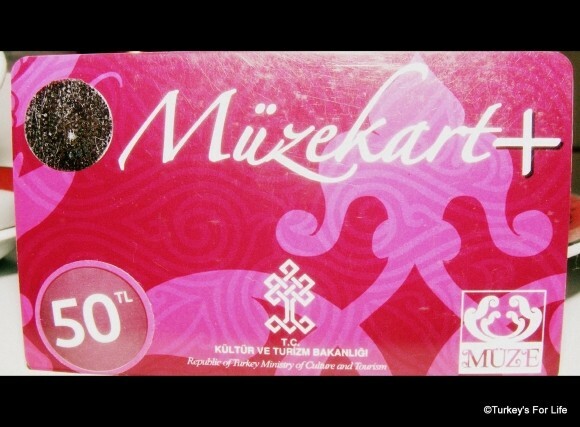 The Müzekart+ costs 50 TL and is valid for one year from the date of purchase. With the Müzekart+, entrance to sites and museums is unlimited – you can come and go to each site as many times as you please. Perfect for us, and the reason we opted for the 50 TL card. The Müzekart+ also gives discounted entrance to many private museums, including free one-time entry to some, discounts in some museum shops and discounted tickets to state theatre, opera and ballet performances. As we were passed our new Müzekarts, we were also given a Zurich Sigorta leaflet. “This is your accident insurance,” said the guy. We thought this would be for if we had an accident actually inside one of the museum sites – but apparently, it is general accident insurance. We are yet to look into exactly what we’re covered for (we need to get it translated) but as we’ll be carrying our cards with us all the time, it’s good to know we’ve got that extra bit of cover when travelling around Turkey…and hopefully, it is never needed! NB: The accident insurance is included in the fee of the card. We’re not sure if it’s also available with the standard Müzekart or if it’s just for Muzekart+ holders. Check when you go to make your purchase. The Müzekart is perfect for people like us who love to go to different museums and sites. We will soon make our money back and, in the end, save. For example, if you’re travelling to Istanbul, the 2013 entrance fee to Aya Sofya alone is 25 TL. 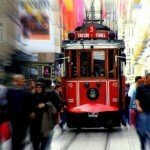 There are too many other places to mention for Istanbul but you’ll easily make a saving if you’re hitting the museums there. Around Fethiye, entrance to sites is generally cheap (Kayaköy, Letoon and Xanthos, for example, are all 5 TL per person) but this year, for various reasons, we’ll be wandering around Kayaköy on numerous occasions. We’ll probably make our money back locally before we’ve even travelled anywhere else in Turkey! To get your Müzekart, you need to show your residency booklet and ID number. Your ID number is not your residency (ikamet) number. It’s the number beginning with 99. If you took up SGK, you will have this already. If not, you can get it here. It only takes a minute to do. In Fethiye, the only place you can pick up a Müzekart is from the entrance booth to the ruins of Kayaköy. Along with your Müzekart, you will be given the relevant booklet which tells you the places, by region, where free and discounted entrance is available. It’s a long list! Some places are listed on the official website but there are more listed in the book, too. 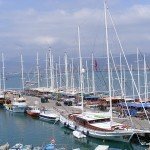 Living in Fethiye: Saying Goodbye is Rubbish! A fantastic idea for lovers of old ruins like us and good news that it’s been extended to bone fide residents. Came too late for us though! . . and there was me thinking it had been discontinued for foreigners. Until jan 1st 2013, there was only one musekart and it allowed multiple access to sites. Then there was a rethink and hence the two cards. I’m glad you got your musekart+, as there has been some debate as to whether residence permit holders could buy the plus card. @ Alan: You need to come to Fethiye then. All up and running here. 🙂 Think you can get them at Kaunos here, too.